On March 6, 2007, as part of the start up effort for the Dolphin24.org website, your webmaster visited the Sparkman & Stephens offices in New Yory City and discovered in their files this unsigned, undated drawing # 1497-C1 for a Dolphin w/fixed Keel, displ 4640 lbs, draft 4’2”. The boat was designed for a Douglas Bremner - a New Zealand client of S&S's. The was no other information in the S&S files that I saw. 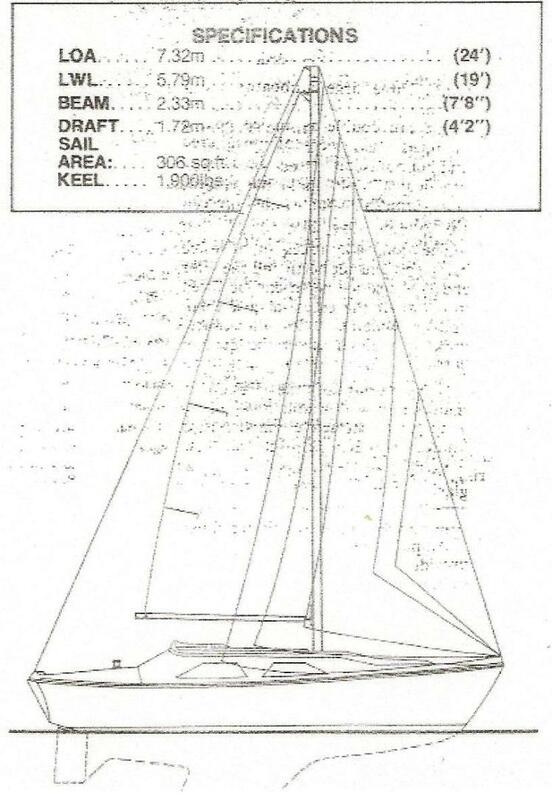 Later, we received a copy of an S&S Plans List that listed "1497-C1 Fixed Keel Version for a W. D. Bremner". Click here to go to it. 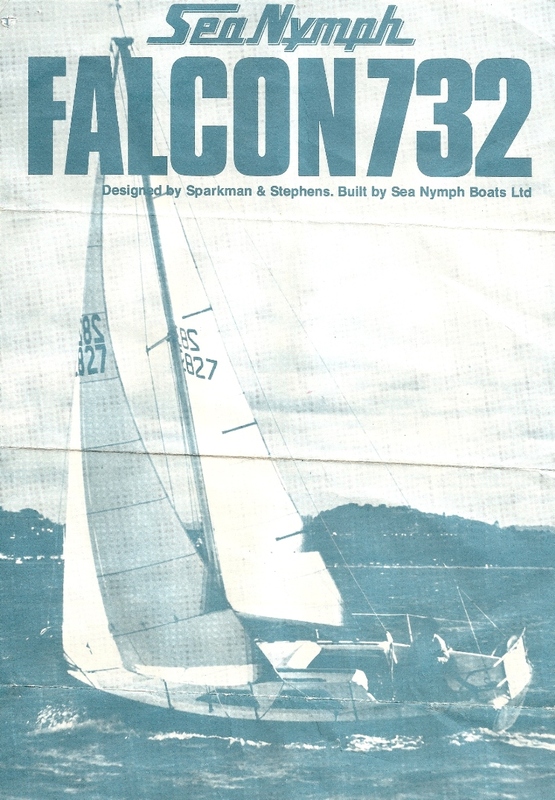 This page, started as a item of technical interest, has developed into a progressive investigation of our Dolphin 24's New Zealand cousins, the S&S 24, and its local offspring, the Falcon 24. With the help of Alan Mountford (Blue Gum) , Stefan Sebregts (Whistler), Steve Summerville (Festina Lente), Giles Grimston (Summer Wine), and others, we have identified many of the 50-60 boats built. They have been listed in a dedicated New Zealand Boats Roster page - and in the larger, Alphabetical Dolphin 24 Roster Section. See bottom of this page for the links. February 7, 2012. Some background. W. D. Bremner - William Douglas (Doug) Bremner was the owner of Sea Nymph, Ltd/Marine Plastics, the company that built the S&S 24. He bought this company after he sold a successful carpet/flooring business. 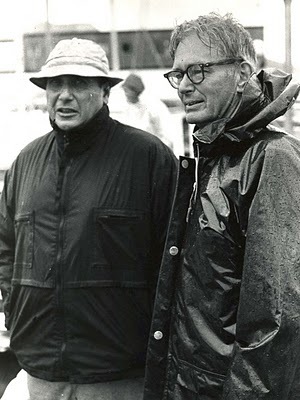 Doug was a racing sailor and knew Olin Stephens. Olin had designed a 60' LOA Bermudian cutter, for Doug in 1964 - at the time Ta'aroa was described as the most powerful keel yacht ever built in the Southern Hemisphere. She was constructed out of old heart Kauri recycled from the original Auckland Hospital wards, which were being demolished at the time. The picture at left is of Olin Stephens (on the right) and Doug Bremner. The boat had a disappointing racing record until Olin came to New Zealand, sailed aboard her and undertook some tuning and design changes. In 1971 Ta'aroa commenced an illustrious racing record. More on this interesting story can be found at the Sparkman & Stephens website - click to go there. 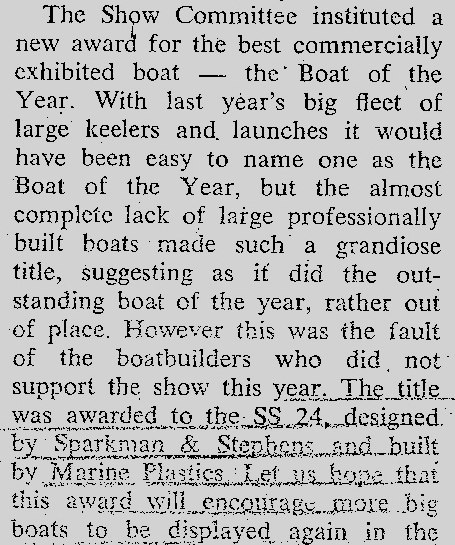 According to Doug Bates, the owner of the first S&S 24 (Sprite) and a colleague of Doug Bremner, plans for the S&S 24 were received from Sparkman & Stephens in 1968 and the moulds built by Sea Nymph in 1969. In 1973 Wallace McNair, a well known classic race car enthusiast wanted a boat like the S&S 24 but wanted a more modern look. He got together with Ferris de Jous - a fiberglass body (for race cars) designer, and the Falcon 24 was conceived. We have a report from sailmaker Dave Gliddons that the deck mold for the S&S 24 was broken which may have contributed to the new deck decision. Sea Nymph supplied the S&S 24 hull and Ferris de Jous' company, Fiberglass Developments, put together and marketed the Falcon 24. More of this story is told further down this page. February 8, 2012. We have been fortunate to have people who knew Doug respond to our request for help in putting together the story of Doug Bremner and Sea Nymph. We have consolidated some of their responses in a page called Sea Nymph. Click to go there. February 6, 2012. Webmaster Note: It seems our S&S 24 began scaring away bigger boats even in the showroom!! February 17, 2012. 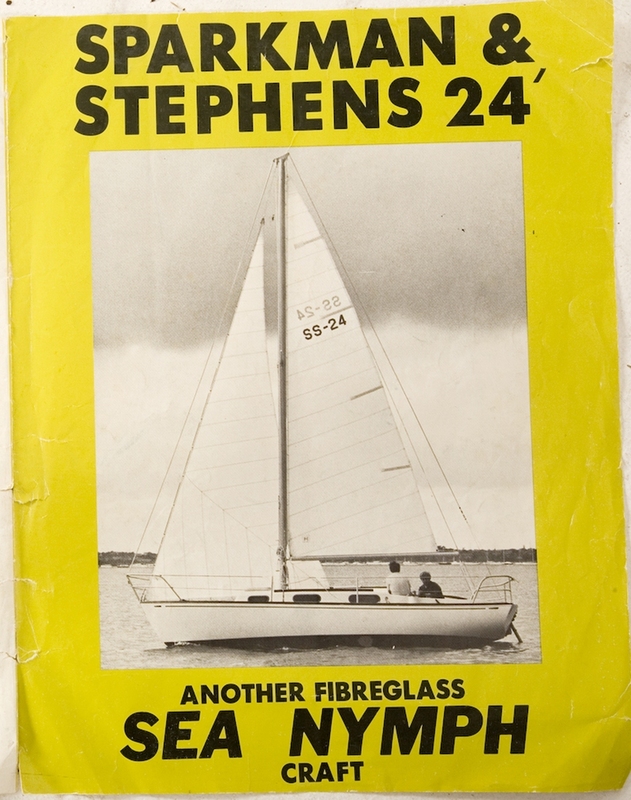 Doug Bates, first owner of Sprite, the first S&S 24, sent in this copy of the first S&S 24 brochure. Here is the cover page. Click here to view all four pages. Alan Mountford (Blue Gum) was our first investigative reporter from Down Under. 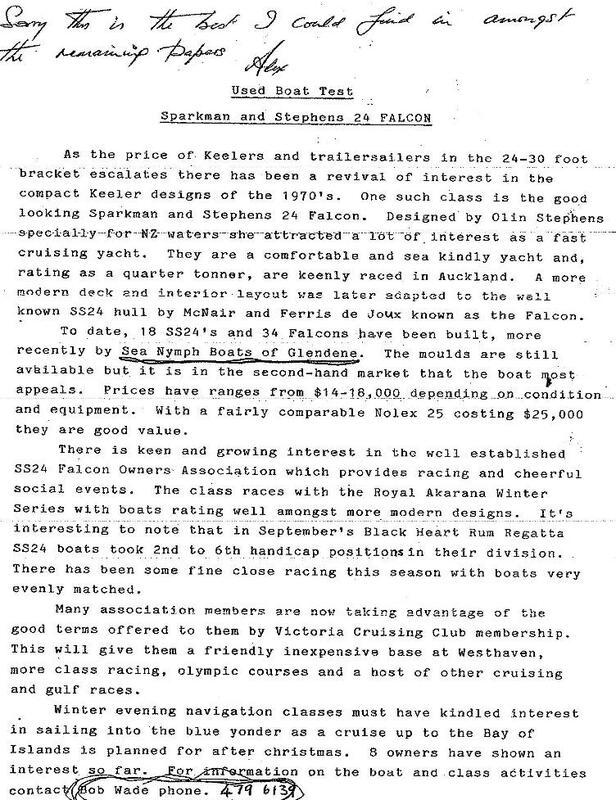 He sent in the following email and a copy of a December, 2003, Boating New Zealand Magazine article that tells us a lot about the S&S 24 and the Falcon 24. 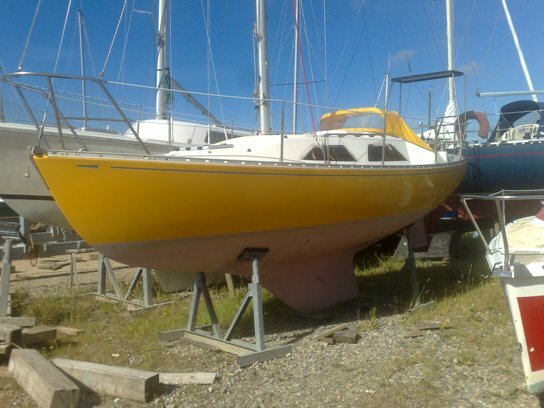 I received information relating to the S&S 24 Falcon a couple of days ago from Boating New Zealand Magazine. I spoke to them on the phone while I was in Auckland, NZ, and they said they would send what they had. Attached (below) is the article which they have sent me. It appeared in their magazine in December 2003 edition. I have also been able to track down Ferris de Joux's phone number. So hopefully I will be able to get in contact with him at some time. 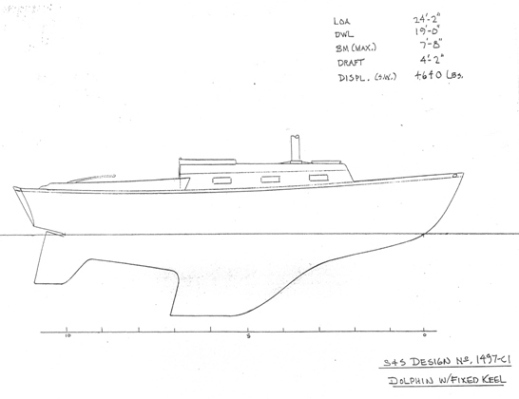 Design number 1497 from Sparkman and Stephens (S&S) was the Dolphin 24, designed in 1960 for American boat­builder, O'Day Corporation. Marketed by US Yachts Inc from 1960 until 1966, O’Day built the 24s, until Yankee Yachts took over production and renamed the boat the Yankee Dolphin. In the early 1970’s the Pacific Yacht Company took over production and renamed the boat the Pacific Dolphin. S&S could not provide exact numbers built in the USA; research suggests several hundred. Doug Bremner of Sea Nymph introduced the Dolphin to the New Zealand market in 1968 (Webmaster Note: this date maybe an error, perhaps 1969 or 1970? - also note that the writer uses the phrase 'introduced the Dolphin'). Sea Nymph built nearly 20 of them marketing them as the S&S 24. Then in 1973, Wallace McNair wanted one for himself but he didn't like the standard deck/cabin shape and had car designer Ferris de Joux redesign the cabin/deck. Eventually, de Joux set up production of this modified version as the Falcon 24, with Sea Nymph laminating the hulls on contract. De Joux built around 35 boats, before the 1979 Muldoon sales tax forced him and McNair' to give up boat building, they drifted back into car design, building and racing. As designed, the Dolphin was a trailerable centreboarder, but the New Zealand, boats had a longish, fixed keel. (Webmaster Note: According to Doug Bates, a colleague of Doug Bremner, Bremner went to the US to talk with Olin Stephens and asked him for a fast small boat that could compete well in New Zealand conditions. 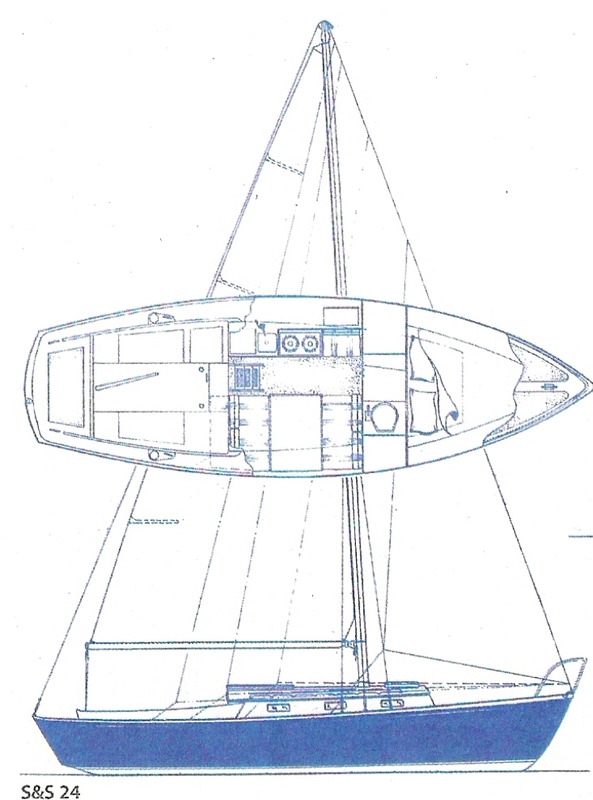 The design Olin suggested was a Dolphin 24 with a fixed keel.) The S&S has a deep underbody, balanced ends and a lively sheer. Displacement is generous at two tons, with a 35% ballast ratio. The lay-up specifications were provided by S&S, and consisted of a solid GRP hull, with a balsa core decks and cabin. The original versions had an outboard engine mounted in a well aft with a cut-out through the transom, effective but hardly pretty. The Falcon version mounted the outboard on a transom bracket. Some boats have inboards; the Vire petrol engine was popular for a time. The layout of the later versions has twin quarter berths, the galley to starboard, seating opposite, and with the head and twin V berths in the bow. The S&S performs best upwind. The mainsail is quite low aspect and requires reefing reasonably early, but the boat is forgiving and predictable. Boating's photographic editor, Mike Hunter, part-owned one some years ago, and is an enthusiastic advocate of the Falcon's heavy weather capabilities, having been out in all sorts of weather condition teaching his wife to sail. He considers it ideal for family cruising. When buying, the de Joux model is the more stylish, and attracts a price premium over the earlier model. However, it is not a genuine S&S design if true classic status is required. When purchasing avoid examples requiring lots of work; it's considerably cheaper to buy the best than have to titivates the worst. The S&S 0wners Association disbanded some years ago. It once numbered more than 90 members. The S&S 24 is a classic 1960s design, while the Falcon 24 is the modernized version. With more displacement than local equivalents, they provide a decent sized interior and easy handling in most conditions. Either version is an ideal pocket cruiser for two.cle. 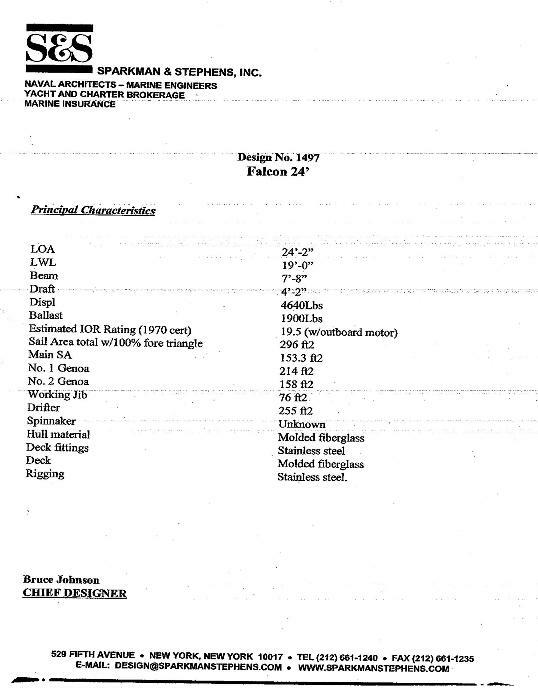 The following is a comparison of S&S 24/Falcon 24 specifications to the O'Day and Yankee/Pacific Dolphin 24, and estimated number of boats built. We have a Rosteralphabetical listing of the S&S 24s and Falcon 24s we know of. It includes some boats which have sail numbers listed by New Zealand Yachting, even though we have no detail about many of those boats. We will update this list as additional information becomes available. Boats about which we have information, and therefore have their own pages here, are also listed on our 'master' Dolphin 24 Alphabetical Roster List. October 30, 2007. We received the following email from Stefan Sebregts (Whistler) in Auckland, and a copy of the referenced Falcon 24 Review in the magazine Yachting and Boating. In the early days of this website Stefan's photos really got the New Zealand boat roster going. Interesting website! I too own a S&S Falcon 24, named Whistler, here in Auckland, NZ. I've owned here now for just over a year and she has given me very enjoyable times. And I have come to appreciate her heavy weather sailing ability! There doesn't seem to be a heck of a lot of info around on these boats, and I think it is a shame that the owners association got folded. Anyway, I do have a review of the Falcon, out of a boating magazine. Unfortunately, it is not dated, so I don't know exactly when it was published. I think visitors to your website might be interested in reading this. I know I sure was happy reading a bit more about what I think is a boat that deserves a bit more attention! So, attached you will find a PDF file of the article. I also have a number of photos that I've accumulated of various Falcons. (Some of them showing different interiors). If you are interested in these for the website, let me know. Enjoy. On September 28, 2008 we received an inquiry from David Le Mestre who lives in Morocco but vacations in Brittany, France where he saw a boat that caught his interest. David was looking for information that could help him get a European Certification for a Falcon 24 built in New Zealand. He sent in a picture which is below. This had the potential for an interesting story! We subsequently found out this boat's name is Natine and she had been sailed from New Zealand to the Caribbean single handed, and double handed to Brittany, France! Later, David advised he bought her and renamed her Davarsa. To go to the boat, click on their names. January 2, 2009. 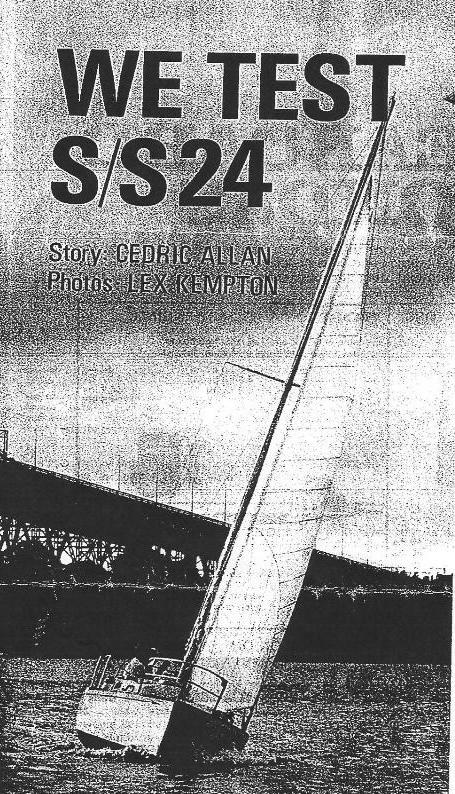 David LeMestre sent in an interesting article from the June, 1970 issue of NZ Yachting and Boating Magazine entitled "We Test S/S 24" by Cedric Allan and Lex Kempton. The copy leaves a little to be desired and we are working on getting a better one. Use your Zoom button to enlarge it if necessary. Click the return arrow on your browser to get back here. Included with this article is an ad for the S&S 24 from an Ottahuhu/(Auckland) dealer, Rutherford Marine. February 5, 2012 Webmaster Note: Interestingly, there is a hand written note on that ad indicating that the new name of Rutherford Marine is McDell Marine, Ltd.
April 2, 2011. An email from Alan Montford (Blue Gum), regarding the Wallace McNair/Ferris De Joux relationship in the development of the Falcon 24, prompted some more Internet research. First, we must announce here that Ferris de Joux passed away on May 30, 2009, and Wallace McNair passed away on October 30, 2009. WRONG!!! Webmaster Note, June 15, 2014 Today, we heard from Wallace McNair who is very much alive!! We leave the following text in place to preserve the 'historical record' - proof that you should not believe everything you read. The Wallace McNair whose obit we discovered on our Internet search was Ian Wallace McNair, a cousin. (Ian) Wallace McNair was a head of a New Zealand marketing research firm founded by his father, and which came into greater prominence with the McNair Survey which was recognized in New Zealand as the premier polling/research firm, not only for consumer attitudes and preferences but for political polling. Wallace was a classic sports car enthusiast and this is undoubtedly(???) how he knew Ferris de Joux, a very well known NZ engineer/designer of different sport car body designs based upon competitive international sports cars. And, Doug Bremner was also into racing cars, of the hill climbing variety. It seems Wallace wanted a boat like the S&S 24 but with a more modern appearance, and headroom (1) and he had Ferris De Joux redesign the S&S 24 - perhaps with the idea that this new version could be marketed as a new boat in place of the S&S 24. There is evidence to suggest that the capital to build the new molds necessary may have been from McNair, or perhaps a McNair/de Joux joint venture. The new boat's hand laid up hull was to the same as the S&S 24 and contracted to be built by Sea Nymph, the company that was owned by Douglas Bremner, and which built the predecessor S&S 24s. Bremner sold Sea Nymph to two employees, Kim McDell and Peter Gibbons. Webmaster Note: The website discipline insists on a chronological listing of our posts. Please check out Wallance McNair's email of June 15, 2014, below. March 27, 2012. We have a Roster with an alphabetical listing of the S&S 24s and Falcon 24s we know of. It includes some boats which have sail numbers listed by New Zealand Yachting, even though we have no detail about many of those boats. We will update this Roster as additional information becomes available. Boats about which we have information, and therefore have their own pages here, are also listed on our 'master' Dolphin 24 Alphabetical Roster List. January 23, 2013. We are collecting some interesting information regarding sails for the S&S 24 and Falcon 24. This is currently a work in process. Click here to go to that page. Webmaster Note: A special thanks to Giles Grimston, Summer Wine who helped reorganize this dedicated New Zealand 'Home Page'. July 25, 2013. We have some new and interesting technical information regarding Falcon 24 hull construction, keel bolts, depth sounder/location, and log. It is listed in our Technical Section. Click here to go there. I have just read your information on these yachts and feel the need to correct minor information. I suppose it is minor to read about one's demise but the truth is I am still very much alive and hope to stay that way for some years. Your search of information has yielded the death of my cousin Ian Wallace McNair who was indeed involved in the McNair Research organisation begun by his father. This Company was based in Sydney and, to my knowledge, Ian McNair had no interest in yachting. 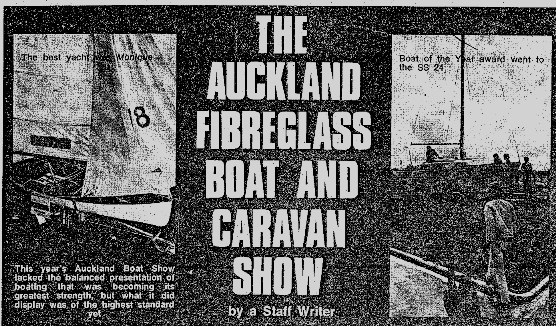 In 1971 I built an 18ft trailer yacht named Kestrel, and exhibited it at the Auckland Boat Show that year. It was the first fibreglass yacht of its type here and was an original hull design from myself and a deck/cabin top by my friend Ferris deJoux. Kestrel became an overnight success and several hundred boats were built prompting a number of other builders to jump into this new and untapped market. The Falcon came from my desire for a small keel boat suitable for my young family. I had seen the S&S 24 and felt that, while the hull looked good, it suffered from limited headroom and accomodation and appeared quite dated. As a one-off, I purchased a hull from Sea Nymph Ltd and had Ferris de Joux design the deck for me. I built a mould for this, and also moulds for the accomodation interior and completed a boat for myself. Having seen the finished article, Sea Nymph agreed to sell us further hulls which we would build and sell as the Falcon 24 and, in fact, moulded the decks and components for us on contract. Ferris and I entered an agreement where his Company, Fibreglass Development Ltd, would hire the moulds from me on a royalty basis and would take over the manufacture and marketing of the Falcon. Eventually, the moulds were sold to Sea Nymph Ltd and Ferris Built a 26ft trailer yacht named Trojan, with hull designed by Alan Warwick. After selling the Kestrel moulds I developed a 6 metre trailer yacht named Redwing, a centre cockpit design with a cast iron drop keel. Some 48 were built in 1977/78 before succumbing to the Muldoon boat tax. Ferris and I built a 36ft One Ton yacht for ourselves based on the Cavalier 36 hull and sailed it for several years together. Sadly you are correct about his demise. He was a pioneer of fibreglass in NZ and was a very clever designer. I trust this will clarify your understanding.